Fashion plate. 1836-38. 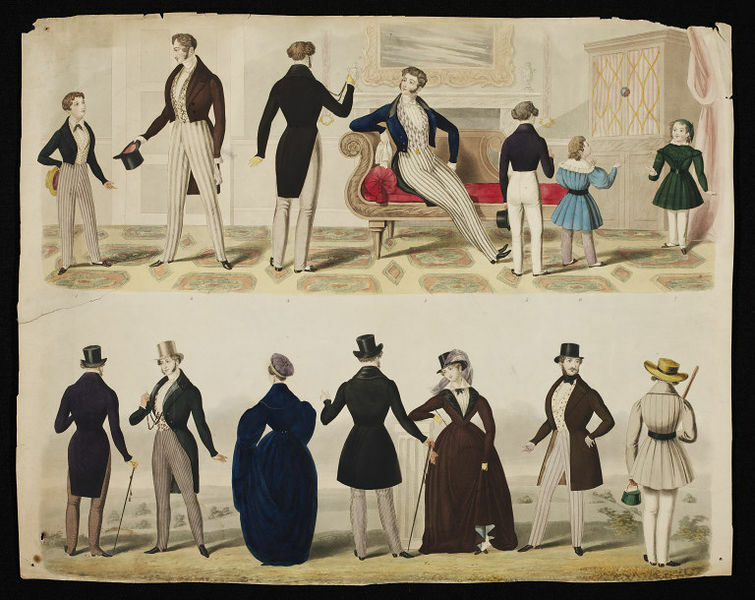 Mostly men's and boys' dress, with a couple of women in riding habits. 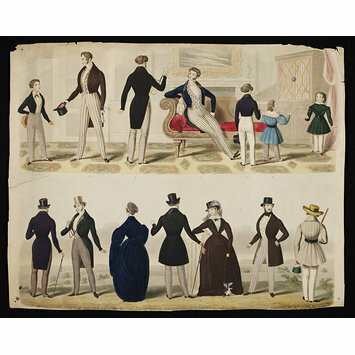 The upper row shows three men in a room two standing and one sitting on a chaise longue, with four boys, the older two dressed in miniature versions of the men's costumes (without tails to their coats) and the younger two in knee-length tunic frocks over trousers. The lower row shows five men and two women walking outdoors, two of the men in cutaway tailcoats, two in frock coats, and one to the far right informally dressed in a summer-weight linen coat with a straw hat. The women wear dark coloured riding habits, one in dark blue with leg o'mutton sleeves, one in brown with a masculine habit shirt and collar and worn with a top-hat. Fashion plate. Probably English, 1836-38, Mostly men's clothing, some children's and women's clothing. Hand-coloured etching.